The 373 state-of-the-art luxury apartments and penthouses located in Dubai Marina will be completed in Q1 2019. Engel & Völkers has been appointed exclusive sales agent to officially launch the final phase of Sparkle Towers, owned by Dubai-based and RERA award-winning real estate development company Tebyan, in the Dubai Marina. Investors can choose from a range of luxuriously appointed studios, one-, two- and three-bedroom apartments as well as two four-bedroomed penthouses. Prices start from AED 845,000. Elements of the towers are marvelled by Swarovski. The building façade consists of over 1,500 lights – making the towers 'sparkle' at night. Pictured: The interior of an apartment in Sparkle Towers. Image supplied by Engel & Völkers. “What makes this development unique is our partnership with the global luxury brand Swarovski, the incredible sea and marina views from every apartment, and a contracted handover in less than four months,” commented Mohamed Abdullah Faraj, Managing Director, Tebyan Real Estate Development. “Moreover, Sparkle Towers has an enviable location, just two minutes’ walk from the beach, as well as close proximity to a host of shopping, dining and entertainment attractions in JBR and Dubai Marina. “Commuters are well catered for too, with Tram and Metro stations nearby and seamless access to Sheikh Zayed Road,” he added. 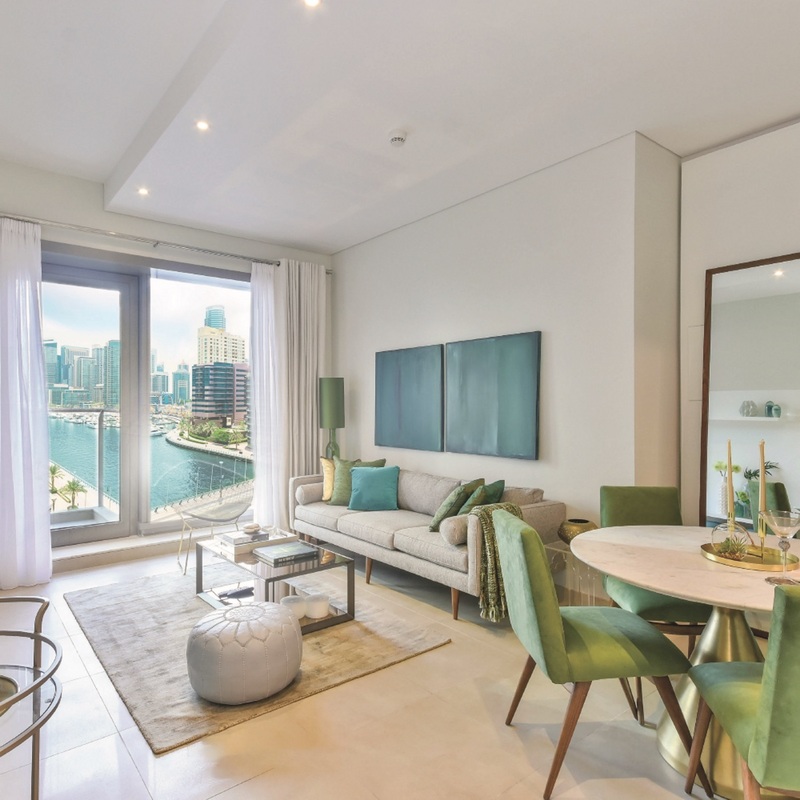 Located in one of the last remaining plots in Dubai Marina, Sparkle Towers is a twin-tower development consisting of 29 and 14 storeys respectively and connected by a four-floor residential podium. Residents of the development will be greeted by a marble entrance and a crystal decorated lobby and common areas thanks to the creative designers at Swarovski. All residences feature marble and ceramic flooring, granite countertops, and the finest European bathroom fittings and finishes, along with crystal encrusted apartment number plates. Matthew Bate, CEO, Engel & Völkers said, “With prices starting at AED 845,000, the value for money aspect is exceptional, given the quality of build, location, panoramic views and of course the project’s partnership with Swarovski makes the investment proposition crystal clear. “This is undoubtedly an iconic building and branded landmark for many years to come, adding further value for investors, in a community that has very few building plots remaining. Little wonder that we have already experienced unprecedented demand from investors and end users,” added Bate.